This bold and vibrant autism awareness key chain would make a fantastic accessory for any friend or family member you know who loves someone with autism. They can spread their knowledge about the autism spectrum while they're on the go and get others on board in the fight for a cure. 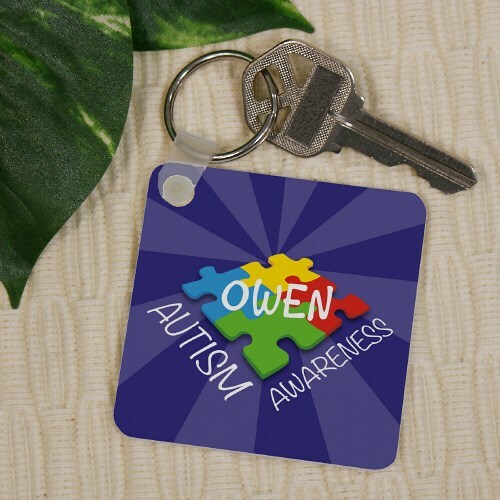 Autism Awareness Products like this Autism Awareness Puzzle Piece Keychain measures 2¼" x 2¼" and is 1/8" thick. It is made of fiber glass reinforced plastic and includes a key ring. Free personalization of any name is included. Additional Info Give your friends, loved ones, and members of your autism awareness walk team. It'll make a great gift for everyone who worked hard to help you raise funds for your event. Our Personalized My Hero Autism Awareness Key Chain is another great gift idea.